Under the tax plan currently before Congress, billionaires like U.S. Secretary of Education Betsy DeVos would save hundreds of millions of dollars. 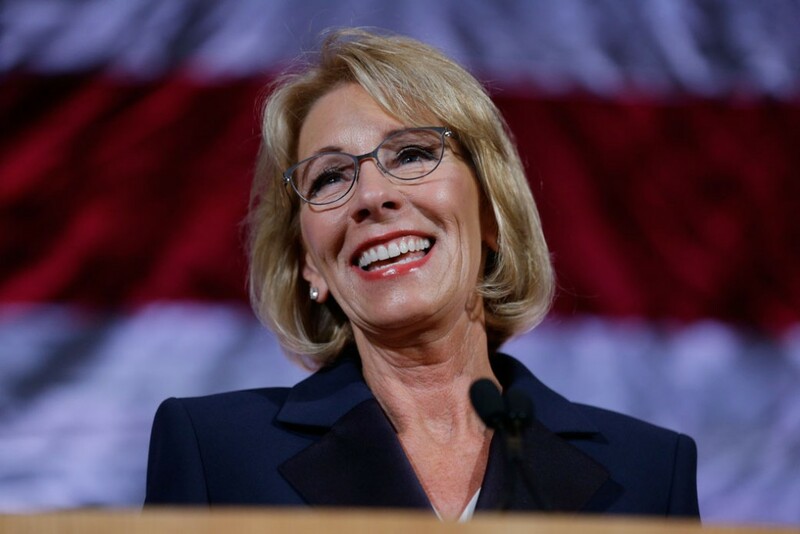 A new analysis by the Center for American Progress Action Fund suggests that the money used to give DeVos and her family just one of these tax breaks would be enough to pay more than 6,000 teachers. Similarly, the money used to give President Donald Trump and his family an enormous tax break would be enough to pay more than 20,000 teachers. CAPAF’s analysis underscores how the House GOP plan will drain federal revenues. Yet, Betsy DeVos is one of several cabinet members who would reap millions as a result of the House Republican plan to eliminate taxes on multimillion-dollar estates. The plan also caps the tax rate on the income of wealthy owners of businesses like Amway, which the DeVos family owns. While many have examined how the plan will hurt ordinary working families and concentrate economic power in the largest corporations and the ultrawealthy, the magnitude of the tax cuts for the wealthy is difficult to understand. To put the effects of these cuts in perspective, CAPAF calculated the tax breaks that Betsy Devos and Donald Trump and their families would gain from just one provision of this plan and compared the value of those tax breaks to the cost of providing teachers for the nation’s students. For the analysis in this column, the authors relied on the previously mentioned CAPAF column, as well as the U.S. Department of Education’s 2016 allocations for selected programs and the Michigan Department of Education’s 2017 allocations to determine the amount of the state’s 21st Century Learning Centers grant and Title II grant awards, and divided the estate tax gain DeVos’s heirs would see by these numbers. The authors also used the average public school teacher salary determined by the National Center for Education Statistics, and the median bus driver salary determined by the Bureau of Labor Statistics, and divided the estate tax gain the Trump family would see by those numbers. To be clear: The federal estate tax does not fund state teacher and bus driver salaries; however, the comparison provides a concrete way of understanding the magnitude of just one of the many tax breaks for the wealthy contained in the House and Senate tax plans. DeVos’ family would gain $351 million from the estate tax repeal, according to the CAPAF analysis. The DeVos’ tax break amounts to more than five times the amount of federal money her home state of Michigan received for teacher professional development. Alternatively, the amount of the DeVos’ estate tax break alone could fund afterschool programs in Michigan for about 10 years. Or, that amount could pay the salaries of more than 6,000 badly needed public school teachers. Repealing the estate tax will give Trump’s heirs a $1.15 billion tax break, according to CAPAF’s calculations. That revenue would be enough to pay the salaries of more than 20,000 public school teachers, or more than 36,000 bus drivers, of which there is a shortage. Again, federal estate tax revenues do not fund state public employee salaries, but the comparison is useful for understanding how large the proposed tax cuts for the wealthy are. The proposed House tax plan would provide a huge windfall to corporations and wealthy Americans. The numbers described above understate the benefits that accrue to the richest families, many of whom would gain from corporate tax cuts, the elimination of the alternative minimum tax, and the creation of a special new loophole for business income like the kind that Betsy DeVos gets from Amway. These tax giveaways to the wealthy would have a negative impact on students and would lead to cuts in many other middle-class priorities, as well, like Medicare and Medicaid. Instead of giving tax cuts to the wealthy, Congress should be investing in public schools and other middle-class priorities that will make our nation’s schoolchildren and our economy strong. Ulrich Boser is a senior fellow at American Progress. Abel McDaniels is a research assistant for K-12 Education at American Progress.